Top is the Disappearing 9 Patch blocks cut differently, next a closeup of several blocks, then some ofthe infamous nickel blocks and last the Loose Change book. 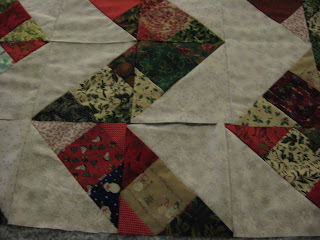 I made the D9P blocks from 5" Christmas fabric swaps and had to cut some from my stash. 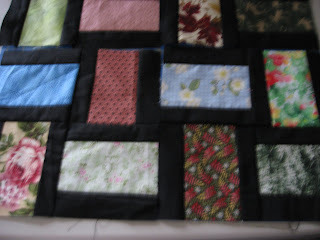 After the blocks were sewn into 9 patch blocks, I cut them from corner to corner. This resulted in 36 triangles. Then I cut 9 14 1/2" blocks of the sparkly white fabrics. 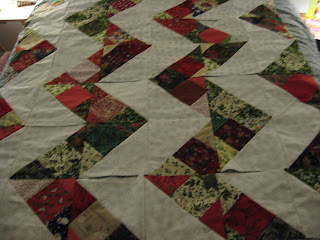 Next I cut those 9 blocks into quarter square triangles. Another 36 triangles appeared as if by magic. Sewn together into blocks, trimmed to 9 1/2 " size and laid out in a pleasing pattern. I rearranged again today after I sewed one row which resulted in this ZZ pattern. Good name...ZZ D9P. Our Triangle Guild President Judy saw the D9P cut this way when she was in AZ. Another one of those 'just had to try it' blocks. 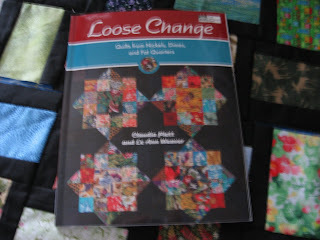 The Nickel Brick pattern is in the Loose Change book and is mindless sewing. Just cut 3x5" scraps and cut the black into 1 1/2" strips. Sew black on both sides of the scraps and cut into 5" pieces. Julie's Latest Doings has a tutorial for this quilt. And now it's time for my nap before I go to the Broome Co. Public Library for my 3 hour volunteer stint tonight up in the Local History & Genealogy Room.